GREAT PRICE FOR A FINE DRAM. Unlike most distilleries, The Balvenie still uses traditional methods in the productions of their whisky. The barley used is grown by the distillery on their land, and the water used is from the pure natural springs in the Conval Hills. The Balvenie Distillery is the only Speyside Distillery to have its own floor maltings, thus reinforcing its links with traditional methods of Scotch Whisky production. The Balvenie employ their own coppersmith to tend to the stills and coopers to look after the casks, so The Balvenie employees have the wisdom of experience when making the whisky. Marrying is a dying art in Scotch Whisky making, but it ensures consistency and high quality in the spirit, and The Balvenie and Glenfiddich are two of the few distilleries left that still marry their whiskies after maturation. The Balvenie Doublewood is a 12 year old single malt which gains its distinctive character from its maturation in two woods. 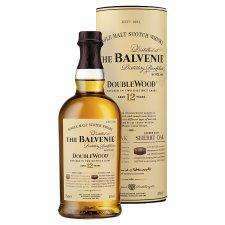 The Balvenie won Gold Medal in the International Wine & Spirit Competition and the International Spirit Challenge 2001. -36 and not a post to say why????? Exactly,this site has a lot of morons who wouldnt know a good whisky anyway.